Myrts is committed to providing the Perfect Guest Experience to all Guests. Part of this experience includes providing accessible and equitable Guest service. Myrt's will provide its goods and services in a way that respects the dignity and independence of our Guests with disabilities. Myrt's will offer Guests with disabilities the same opportunity to access Myrt's goods and services and to benefit from them in a similar way as other Guests. Myrt's is committed to meeting the accessibility requirements under the Accessibility for Ontarians with Disabilities Act. This policy outlines the provision of goods and/or services to Guests with disabilities including the use of assistive devices, service animals, and support persons by people with disabilities. This policy also covers how to notify Guests about temporary disruptions in services and facilities, training, Guest feedback relating to Myrt's goods and services, and notifying Guests about the availability and format of certain documents. Myrt's has developed, and will continue to maintain a Multi-Year Accessibility Plan outlining the Company's strategy to prevent and remove barriers from its workplace and to improve opportunities for persons with disabilities. The Multi-Year Accessibility Plan will be reviewed and updated (where applicable) at least once every ten years, and posted on the Company's website. Upon request, Myrt's will provide a copy of the Accessibility Plan in an accessible format. Communicating in a manner that takes into account a Guest's disability. Myrt's will communicate to Guests with disabilities in ways that take into account their disability. We will train our service Associates on how to effectively interact and communicate with our diverse community and people with various types of disabilities. One of Myrt's goals is to provide the Perfect Guest Experience for all Guests, including people with disabilities. Accordingly, Myrt's has established a feedback process to ensure Guests with disabilities are able to provide us with feedback on our products/services. Feedback is always welcome and appreciated and can be submitted in the following formats: in person, by telephone, by mail, by email or by website e-submission. Myrt's will continue to ensure that its Guest feedback process is accessible to Guests with disabilities by providing or arranging for the provision of accessible formats and communications supports, upon request. Upon request, Myrt's will provide, or will arrange to provide information in an accessible format and with communication supports in a timely manner that takes into account a Guest's accessibility needs due to his/her disability. Myrt's will consult with the Guest making the request in determining the suitability of an accessible format or communication support. Myrt's will also notify the public about the availability of accessible formats and communication supports. Notification will be given by posting the information in a conspicuous place owned and operated by Myrt's, the Myrt's Family Restaurant website or any other reasonable method. Myrt's will ensure that its websites, including web content, conform to the World Wide Web Consortium Web Content Accessibility Guidelines (WCAG) except where this is impracticable. CARA is committed to providing fully accessible telephone service to all Guests. CARA will train Associates to communicate with Guests over the telephone in plain language while speaking clearly and slowly. CARA will also make its Associates familiar with technologies intended for persons with disabilities. CARA will offer to communicate with Guests by e-mail, fax, or letter if telephone communication is not suitable to their communication needs or is unavailable. An assistive device is one or more devices used by a person with a disability to help him/her independently complete everyday tasks. 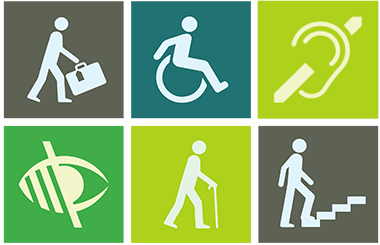 Accessibility devices include mobility aids (e.g., wheelchairs and walkers), portable communication devices, head-wands, hearing aids and much more. Myrt's welcomes the use of assistive devices by our Guests to access our goods and/or services. We will ensure our Associates are trained on how to interact with individuals using various assistive devices and how Associates can provide alternative service methods. Myrt's is committed to providing accessible billing/invoices to all our Guests and third party business partners. Myrt's will answer any questions Guests may have about the content of the billing and will be responsible for ensuring that the alternative formats are available upon request. (b) the person provides a letter from a Regulated Health Professional (including but not limited to physiologist, psychotherapist, chiropractor, nurse, physician, mental health therapist, etc.) confirming that the person requires the animal for reasons relating to the disability. Guests with disabilities who are accompanied by a service animal are welcome at all Myrt's properties when accessing our goods and/or services unless the animal is otherwise excluded by law from the premises. If the animal is legally excluded from the premises, Myrt's will provide alternative measures to enable the person to obtain, use or benefit from its services. Myrt's will ensure that all Associates are properly trained on how to interact with Guests with disabilities and who are accompanied by a service animal. A support person is an individual who accompanies a Guest with disabilities to help the Guest meet his or her communication, mobility, personal care or medical needs or to assist the Guest in accessing goods and/or services. A Guest with a disability who is accompanied by a support person will be allowed to enter myrt's premises together with the support person, and will not prevented from having access to the support person while on the premises. All support persons are welcome at all y properties. Where the presence of a support person is required, any applicable admission fee will be waived. Support persons will not be included where group gratuity fees apply. Myrt's will provide Guests with notice of a planned or unexpected disruption in services usually used by Guests with disabilities. This notice will include the reason for the disruption, its anticipated duration, as well as describe alternative facilities or services that may be available. This notice will normally be posted on a website and may also be posted on the premises, where appropriate in the circumstances. Myrt's will notify its employees and the public about the availability of accommodation for applicants with disabilities in its recruitment process. Myrt's will notify job applicants selected to participate in an assessment or selection process that accommodations are available upon request relating to the materials or processes to be used. If a selected applicant requests accommodation, Myrt's will consult with the applicant and provide, or arrange for the provision of, suitable accommodation in a manner that takes into account the applicant's accessibility needs relating to his or her disability. When making offers of employment, Myrt's will notify the successful applicant of its policies for accommodating Associates with disabilities. Myrt's will provide training for all Associates, Volunteers and third party business suppliers, that engage with Myrt`s Guests, on how to effectively interact with Guests with disabilities. In addition, everyone who is involved with and/or influences Guest experience policies and standard operating practices and procedures will receive this training. Training will be recorded and updated in respect to any changes to the policies, practices, or procedures surrounding accessibility for Guests with disabilities. Training will be provided within the first week of employment. Pertaining to providing accessible customer service to persons with disabilities. Recruitment, including how to accommodate the candidates and Associates with disabilities during the hiring process and employment. Myrt's will continue to inform its Associates of its policies (and any updates to those policies) used to support Associates with disabilities, including policies on the provision of job accommodations that take into account an Associates accessibility needs due to disability. This information will be provided to new Associates soon as practicable after commencing employment. Myrt's will provide individualized workplace emergency response information to Associates who have a disability, if the disability is such that the individualized information is necessary, and if Myrt's is aware of the need for accommodation due to the Associate's disability. Myrt's will provide this information as soon as practicable after becoming aware of the need for accommodation. Where the Associate requires assistance, Myrt's will, with the consent of the Associate, provide the workplace emergency response information to the person designated by Myrt's to provide assistance to the Associate. Myrt's will review the individualized workplace emergency response information when the Associate moves to a different location in the organization, when the Associates overall accommodations needs or plans are reviewed, or when Myrt's reviews its general emergency response policies. Myrt's will maintain a written process for the development of documented individual accommodation plans for Associates with disabilities. If requested, information regarding accessible formats and communications supports available will also be included in individual accommodation plans. Myrt's maintains a documented return to work process for its employees who have been absent from work due to a disability and who require disability-related accommodations to return to work. The return to work process outlines the steps Myrt's will take to facilitate the return to work and will include documented individual accommodation plans as part of the process. This return to work process will not replace or override any other return to work process created by or under any other statute (ie. the Workplace Safety Insurance Act, 1997). Myrt's is committed to developing Guest service policies that respect and promote the dignity and independence of persons with disabilities. Therefore, no changes will be made to this policy before considering the impact on persons with disabilities. Any policy of Myrt's that does not respect and promote the dignity and independence of persons with disabilities will be modified or removed. This policy and its related procedures will be reviewed as required in the event of legislative changes.